December 23, 2014 (Boca Raton, FL) - Thousands of medical practitioners gathered at the Venetian/Palazzo Resort in Las Vegas, NV for the 22nd Annual World Congress on Anti-Aging Medicine. This three-day event proved to be the largest the A4M has ever hosted, as it represented the most attendees, faculty speakers and exhibiting companies to be assembled at one convention. The World Congress ran from December 11th through December 13th with three featured keynote presenters, over 80 speakers from a variety of medical fields and specialties, and over 320 exhibiting companies all housed in the Sands Convention Center. Thursday morning&CloseCurlyQuote;s general session featured opening remarks given by A4M co-founders, President Ronald Klatz, MD, DO and Chairman Robert Goldman, MD, PhD, DO, FAASP. 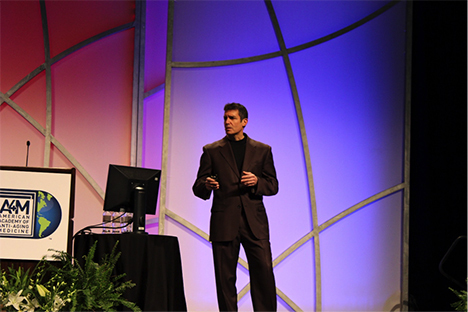 A keynote presentation was given by David Katz, MD, MPH, FACPM, FACP, of Yale University. Dr. Katz&CloseCurlyQuote;s lecture on “Integrative Medicine: A Bridge Over Healthcare&CloseCurlyQuote;s Troubled Waters&CloseCurlyDoubleQuote; received a three-minute standing ovation which kicked the weekend off to an invigorating start. The A4M&CloseCurlyQuote;s World Congress&CloseCurlyQuote;s continuing medical education (CME) event allows attendees to choose from multiple afternoon break-out tracks that are based on different topics. These topics are chosen by the attendee based on which topics are most relevant and beneficial to their practice. Over the course of three days, the topics included the functional medicine approach to treating patients with gastrointestinal and immune dysfunction, lifestyle management, inflammation testing, hormone replacement therapy, metabolic syndrome, menopause, aesthetic treatments, functional neurology, adrenal insufficiency, and much more. In addition to the general conference, there were seven topic-focused, all day specialty workshops offered both before and after the conference. These specialty workshop topics included Personalized Lifestyle Medicine, Optimizing Sexual Function, Bio-Identical Hormone Pellet Therapy, Aesthetic Treatments: Laser and Light Applications, Reversing Physical Aging, Power of Hormones, and Menopause/Andropause: Improving the Health and Happiness of your Patients with BHRT. In addition to the high-level medical education offered over the course of this weekend, attendees were able to visit over 320 vendors offering products and services from the anti-aging industry including supplements, nutraceuticals, aesthetic procedure companies, diagnostic laboratories, compounding pharmacies, practice management and marketing tools, medical products and devices, and much more. Also, the exhibit hall was home to the networking reception, the car giveaway and other raffles offered to all attendees. “It was an exceptional meeting. I learned many clinical pearls and new research as well as met so many interesting colleagues. Thank you to the Academy, once again, for all the dedication and hard work you do&CloseCurlyDoubleQuote; offered John Cline, MD, an attendee and presenter at this year&CloseCurlyQuote;s event. A4M is introducing a power-packed, dynamic, continuing medical education accredited educational calendar for 2015 including four symposiums and two world congresses featuring world-renowned speakers and medical practitioners from all specialties, both domestic and international. A4M offers exclusive membership to all medical professionals where they gain access to over two-decades of established medical expertise. We are also dedicated to educating physician and scientists and are proud to be in our 23rd year of providing first-class continuing education conferences on anti-aging, regenerative and functional medicine. To further demonstrate our commitment to the future of medicine, the shared responsibility for patient outcomes and transforming health education through innovation, we offer Board Certification and numerous educational programs and events offered throughout the year.